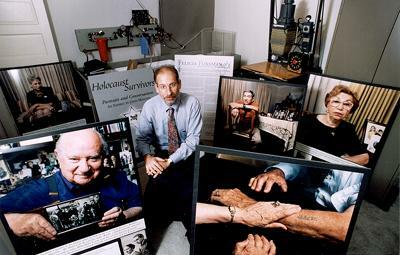 Holocaust Survivors: Photo Gallery - "John Menszer, Project Director"
John Menszer in his darkroom with a part of the Holocaust Survivors: Portraits and Conversations Exhibit. The panels are 4 feet tall. Photo Credit: The Times-Picayune Publishing Corporation. All rights reserved. Used with permission.